North Korea's Minister of Health Jang Jun Sang meets with the United Nations Under-Secretary-General for Humanitarian Affairs and Emergency Relief Coordinator Mark Lowcork in Pyongyang, North Korea, in this photo released July 11, 2018. The U.N. aid chief has found “clear evidence of humanitarian need” in North Korea during a visit that included touring hospitals, nurseries, kindergartens, and cooperative farms. Mark Lowcock’s visit, which began Monday, included meetings with Kim Yong Nam, North Korea’s nominal head of state, and Jang Jun Sang, the minister of public health, according to Pyongyang’s official news site, KCNA. Lowcock made the visit, the first of its kind since 2011, “to understand the humanitarian situation for myself,” he told the VOA Korean Service on Wednesday in Pyongyang, adding that he also saw United Nations agencies, the World Food Program (WFP), the Food and Agriculture Organization (FAO) and UNICEF, are providing assistance in North Korea, which has a “strategy of development and self-reliance,” according to remarks Lowcock made at a Pyongyang press conference Wednesday. The U.N. under-secretary-general for humanitarian affairs and emergency relief coordinator, told VOA that the U.N. is trying to raise $111 million in 2018 to meet North Korea’s health, water and sanitation, and food security needs for about 6 million people. So far, the governments of Canada, Switzerland and Sweden have provided about $11.6 million in aid for North Korea, according to Lowcock. More than 10 million North Koreans are estimated to be undernourished in North Korea. That pales when compared to the devastating famine of the 1990s. Mark Lowcock, United Nations Under-Secretary-General for Humanitarian Affairs and Emergency Relief Coordinator (OCHA) attends a news conference in Geneva, Switzerland, April 26, 2018. Lowcock was making his first visit to North Korea. His responses have been edited for clarity and length. Q: Tell us what you saw in North Korea. A: There are millions of people who are suffering from malnutrition, about half of the children in rural areas don’t have access to safe drinking water. There’s this very severe shortage of basic drugs in many hospitals. I went to a hospital which has 140 patients with tuberculosis but only has the drugs to treat 40 of those people. Tuberculosis is a disease that spreads so, unless it is dealt with, that is going to be a growing problem. Q: What are some changes since the last U.N. official visited North Korea in 2011? A: Some things have improved. So, for example, in 2011-2012, the level of stunting, that’s the effect of malnutrition in children, was something like 28 percent. That has fallen to about 20 percent … useful progress, but, of course, 20 percent is still far too high. Levels of immunization coverage have improved. There are efforts being made to deal better with droughts and floods, which … cause humanitarian suffering. So, there’s definitely progress being made in a number of areas, but equally there are important needs remaining. ​Q: What is the basis of your statistics? Is this North Korean data or from another source? A: When one of my senior colleagues from UNICEF was here, she was able to publish data collected together with the Central Bureau of Statistics on nutritional status and other core health indicators done on the basis of a survey of 8,500 (representative) households. Access is improving. My colleagues in UNICEF, based here in Pyongyang, have been able to visit something like 100 counties round the country recently. The World Food Program has been able to conduct something like 1,800 visits to food distribution centers and kindergartens and other places where they’re working. The World Food Program would like to do a big survey on food security for example. Q: Do you think the WFP could conduct such a survey? A: I hope so, and that’s a matter under discussion. UNICEF (believes) that the data is good quality compared to data … from a number of other countries that we work with. FILE - North Koreans farm in the field, along the Yalu River, in Sakchu county, North Phyongan Province, North Korea, June 20, 2015. 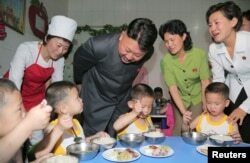 ​Q: Despite decades of U.N. humanitarian aid, food insecurity remains a problem in North Korea. Why? A: Ultimately, for any country, what’s needed to deal with problems like malnutrition, and the availability of drugs in the health system, and clean water and sanitation … is economic development. … Development needs to be faster and inclusive of everybody. In the meantime, we do think it’s important that the U.N. agencies are in a position to continue to reduce suffering and save lives. Q: If the U.N. receives $111 million this year for North Korea, will the humanitarian situation change? A: Last year, U.N. agencies treated 40,000 children with severe acute malnutrition. They vaccinated nearly 350,000 children against killer childhood diseases. They provided clean water to 350,000 people and improved health services through things like drugs and training and supplies to more than 4 million people. So, if our appeal is well-funded this year, we will definitely be able to improve on all of those results. Q: Relations between the two Koreas have improved recently. Has the South Korean government decided to provide any funds for the U.N.’s North Korea projects? A: I know that the government in Seoul is working on that issue and we’ve been in touch with them. What the government here in Pyongyang has been clear about with me is that they do want to see international assistance, in particular. 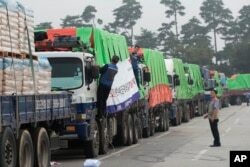 FILE - South Korean trucks with food aid prepare to leave for North Korean city of Kaesong in Paju, South Korea, Sept. 21, 2012. ​Q: The U.S. State Department has criticized food aid to North Korea, saying it freed up millions of dollars for Pyongyang’s nuclear weapons and missiles. And they have criticized energy assistance and cash payments that appear to have helped North Korea advance its illicit weapons and missiles programs. What do you think of that? A: What the U.N. is doing primarily is bringing in … drugs and therapeutic foods for children with malnutrition and vitamin enhancement, mineral enhancement, for foods to deal with malnutrition. … The sanctions that the United Nations Security Council have put in place (have) exemptions with humanitarian assistance. It is not controversial to provide humanitarian assistance or to save lives. Q: How do North Korean officials explain a situation in which chronic food insecurity and undernutrition are widespread, resulting in 1 in 5 children’s growth being stunted? A: They do feel that sanctions contribute to that. They place a lot of emphasis on developing their economy and the policy of self-reliance. They’ve emphasized to me, the top priority … now (is) economic development. They also say that they value assistance from the U.N. in dealing with these humanitarian challenges and reducing people’s suffering and saving lives. 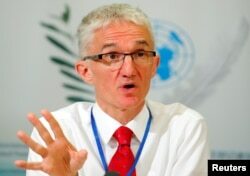 Q: For the past decade, the FAO has assessed North Korea as needing external assistance for food. What needs to be done for North Korea to improve the situation? A: Whether you grow the economy and earn money to import food, or whether you … get more productive producing your own food, one way or another you’re able to meet more of your own needs as a country. And, I think that the DPRK must do that, in the way that many other countries have. A. Well, the U.N. appeal for North Korea is very badly underfunded. We’ve got about 10 % of the resources we need for this year. Now, as you say, over the years, the Central Emergency Response Fund, the CERF, has been an important source of funding for humanitarian action in North Korea especially through the underfunded window. Now I’m considering at the moment the next set of allocations through the underfunded window and that would be something that I would be doing when I get back to New York later this week. And we’ll see where we get to on that, but clearly in the past the CERF has provided an important source of funds for those appeals around the world, of which North Korea has been one, which are underfunded. Q: I understand the reason that CERF couldn’t allocate funds for the first underfunded Emergency round for 2018 because of a banking channel problem. According to CERF “The banking channel utilized till recently for transfer of humanitarian assistance funding to DPRK is no longer functional and with no alternative solution in place for transfers, DPRK was not retained for an allocation for this round.” Is that the case? A: Well, most of what the U.N. does here in North Korea isn’t by sending money in. We bring in commodities, the vaccines, and the drugs for tuberculosis, and the materials for nutritious foods for children and the therapeutic foods for children. We deliver those to hospitals and health facilities. So, the banking channel is an issue in other ways, but it isn’t for us in providing the U.N.’s humanitarian assistance a major operational constraint. Q: I understand UN agencies need cash to operate the office in DPRK, is that correct? A. Well, you’re right. We do need a little bit of cash because we employ staff and we need to pay them, and, you know, we have other local expenses, but that’s really quite a small part of the overall assistance that we’re providing. We obviously collaborate with the government of North Korea in the work and my job is to identify humanitarian need where it exists and try to ensure that it’s met. And it’s clear that the government of North Korea values external assistance to do that as other governments do as well. And we think it’s the right thing for the United Nations to do to contribute to that. Christy Lee contributed to this report which originated with the VOA Korean Service.